What started as a small kiosk in Malacca back in 1992 has now evolved into 11 outlets (all in Kuala Lumpur for the moment) with 2 more on the way. I visited the newest one located at the Sunway Putra Mall, a bright space where it felt nice to just sit and linger for a while chatting with the lovely staff. A friend and I had a bit of a feast at Simple Life and were able to sample dishes from the Malay, Chinese, Western and Japanese inspired fare on offer. Below is what we tasted. 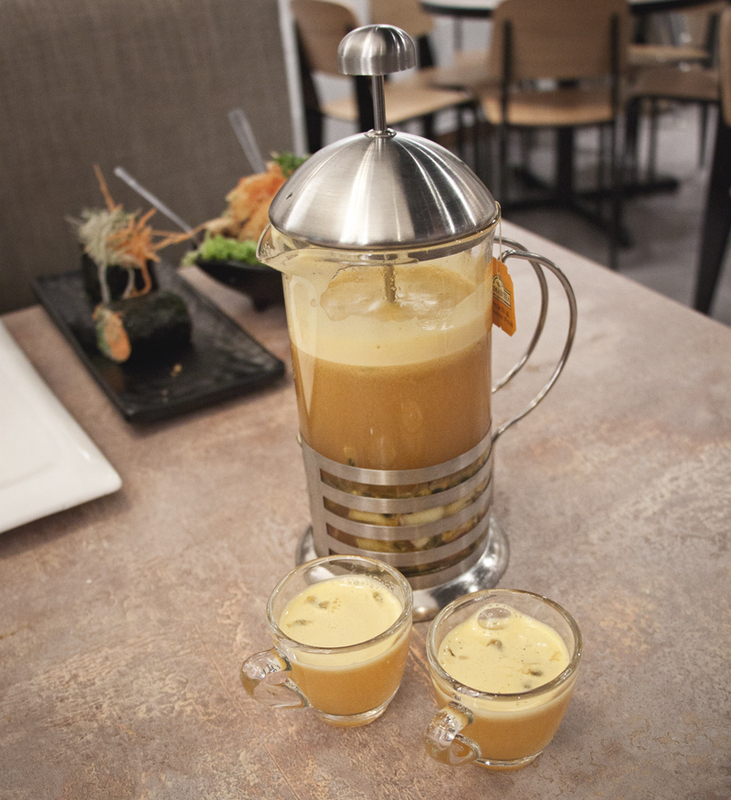 We were first served with this beautiful French press of their signature mixed fruit tea, a delicious, lightly warm peach and passion fruit tea mixed with fresh orange, passion fruit, pineapple, watermelon and apple chunks. I can see why this is their bestselling drink – it is absolutely phenomenal! Order it to share between a few people as it is quite large, and, once empty, you can just get it refilled with more hot water. I’d never thought of having warm fruit juice, but this is a game changer. It is SO delicious! Also known as “thunder tea rice” (a reference to the noise made when pounding the ingredients together), Lei Cha is a traditional Hakka specialty I had somehow never heard of before. It’s such a fascinating dish full of history; I’d love to learn how to make it myself. 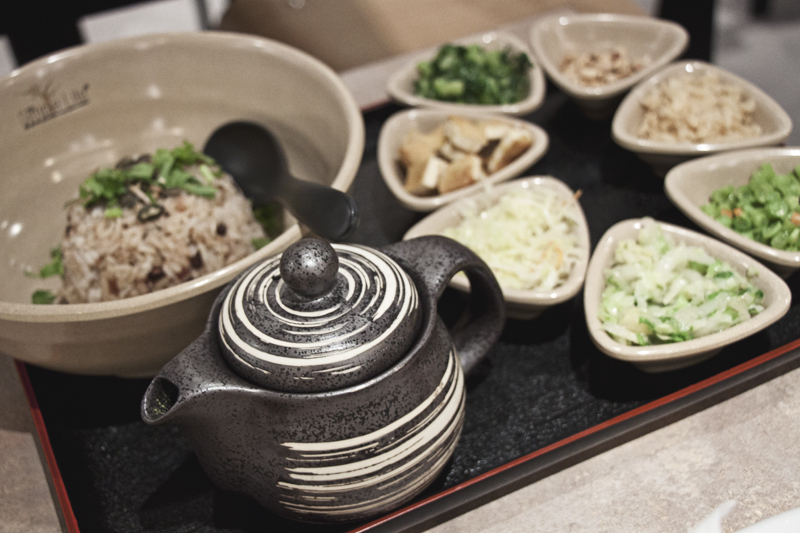 The Simple Life version is an artfully presented tray of multigrain rice served in a large bowl with all the other ingredients in small ramequins around it: peanuts, pickled and fresh vegetables, tofu and a cast iron teapot full of a minty green herbal broth. Our lovely host Chong Kim tells us that you traditionally throw everything in the rice bowl and pour the broth over – I wouldn’t have known! He reassures us that anything goes, and you can really just eat it as you see fit. Once mixed, the presentation loses a bit of its appeal, but it tastes incredibly healthy, nutritious and wholesome. The peanuts add a nice crunch. I really love this and I’m so happy for the discovery! Beware that it is a gigantic bowl of food and is also very filling. It might be a little too big for one person that isn’t so hungry or perfect for two people with a small appetite. Moving on to something a little more Japanese here, this dish has the appearance of a sushi roll, but since it contains no rice, it feels a bit more like a spring roll. 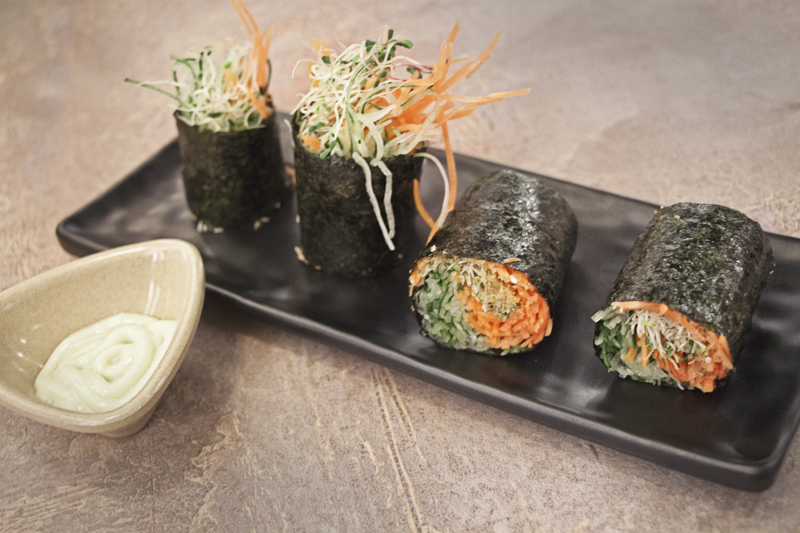 It is a nice light fresh bite filled with carrot, cucumber, sprouts and soy floss, which is a nice crispy addition. I was not so keen on the wasabi mayo that came with it and I wish the waiting staff could have told me exactly what was in there (they assured me it was vegan however), but the rolls were light and fresh and quite delicious. This dish might look a little boring (it’s just tofu!) but you are in for surprise. Never have I tried a tofu so fluffy and pillowy and marshmallowy. 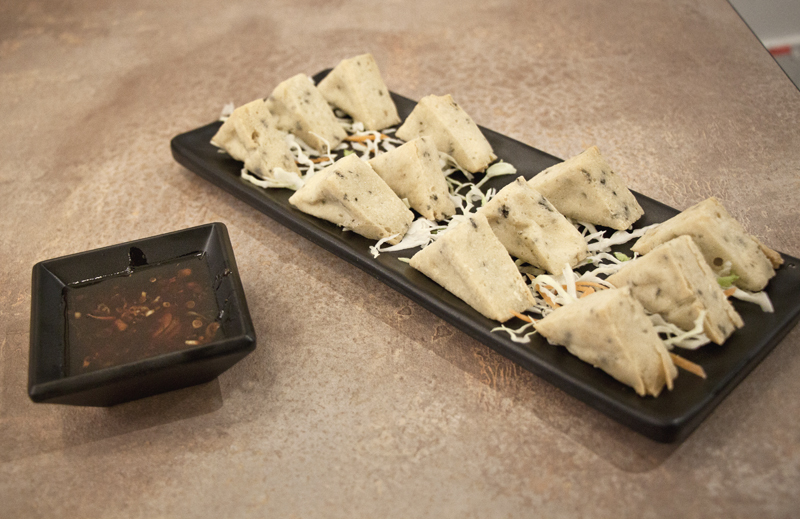 It’s hard to believe it’s actually tofu. The delicately fried crispy outside gives way to an incredibly soft and delicious interior. I didn’t even want to dip it in the accompanying Thai sauce as it was so incredible just as is. I’m generally not the biggest tofu fan, but this was something else. Strangely, the highlight of my meal! Rojak is a traditional fruit and vegetable salad commonly found is Malaysia, Singapore and Indonesia and I had been dying to try it for a very long time, but alas the dressing is made with shrimp paste in most places – obviously not here. The salad surprised me at first by being freezing cold, but after a while it warmed a bit to room temperature and I enjoyed it a lot more that way. It’s a great mix of flavors and textures: a little sweet, a little spicy, a little tart – I really enjoy those fried tofu balls in there: crunchy! I think I can perceive the taste of daun kesum (also called Vietnamese coriander), a herb I am very fond of and commonly found in laksa, which makes it more complex and delicious. I can’t really compare with other fruit rojak out there since this was my first, but it’s a lovely side dish that I will definitely be eating again! This is a lovely, warming dish. 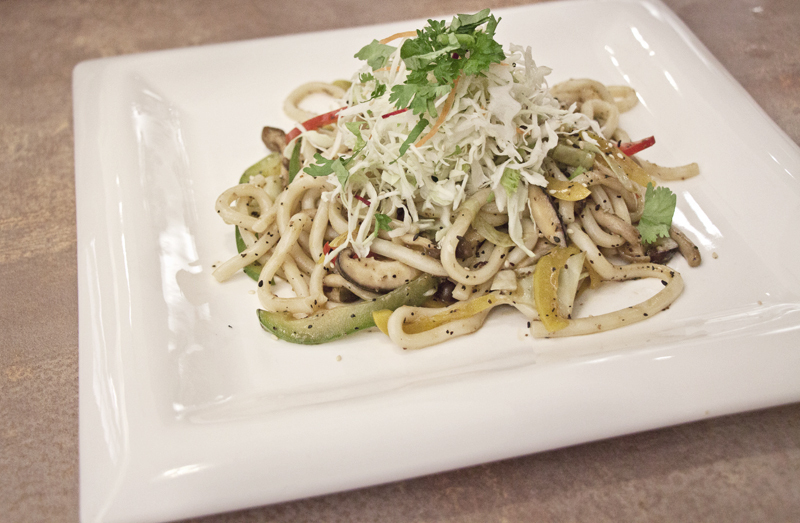 It’s chock full with different kinds of mushrooms, bell pepper and cabbage with yummy, juicy, fat, al dente udon noodles – udon noodles are my fave. There is a nice kick from the black pepper which makes a pleasing change from the chili that is so ubiquitous to South East Asia. A large, hearty and comforting plate of carbohydrate goodness. Delicious! 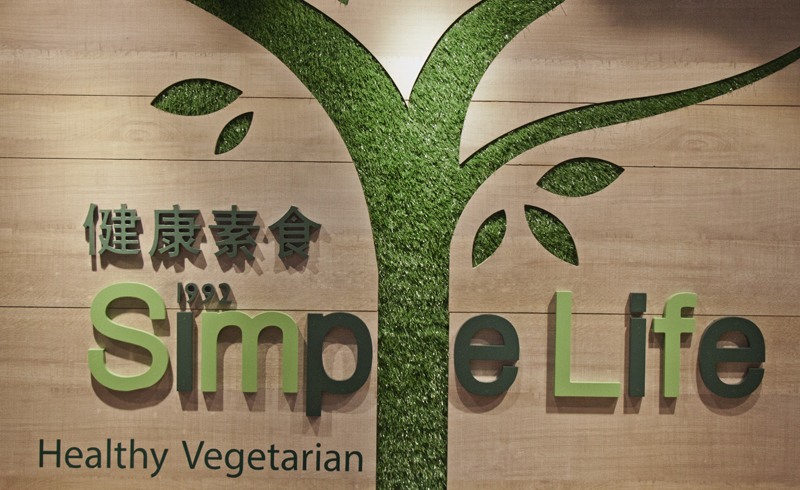 The food at Simple Life is prepared with great care using no msg, no transfat, no coloring and no preservatives, as well as being low in sugar, high in fiber, low in salt and low in oil. The ingredients are mostly organic and locally sourced where possible. Everything is vegetarian and the dishes containing eggs are clearly identified as such on the menu. The dishes containing dairy are unfortunately not, but you can ask your friendly waiter for the fully vegan options, of which there are many. A lot of the non-vegan dishes can also be made vegan upon request. All in all, everything I sampled at Simple Life tasted extremely fresh, honest and wholesome with large portions that represent a great value for money, especially so that some dishes are large enough for sharing. The star of the show for me were the mixed fruit tea and the fried bean curd and I am hoping to return to sample more of their great dishes soon! A fantastic option for vegans in Kuala Lumpur. Many thanks to Simple Life for hosting me and my guest. Be assured that you receive my honest opinion regardless of who is footing the bill. I love the seaweed rolls and the fried black pepper udon. 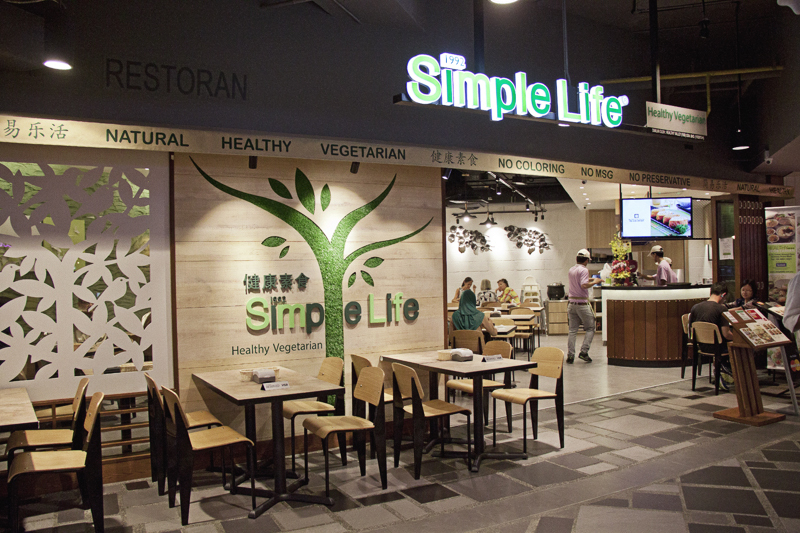 The food at Simple Life looks very delicious and healthy. Win-win. Wow, that all looks so amazing and refreshing too. We didn’t find this place when we visited the area, but we will hunt it down upon our return one day. I just want to drink all of that juice! This place looks delicious! We didn’t get a chance to go when we were in the area but we’ll sure be looking for it the next time! We love the fresh fruit drinks in Malaysia and that mixed fruit tea looks incredible! Yes, it was incredible! Let me know if you ever visit! That’s my kind of restaurant. I love when destinations have a large selection of healthy food. That fruit tea in particular looks very unique. The food looks delicious! I’ve never heard of the chain, although, I’m definitely looking it up when I’m back in Malaysia! This place looks really yum! And that’s coming from a non vegetarian. I really like the sound of that mixed fruit tea, it sound very thirst quenching and delicious. I’ll have to keep this place in mind when I visit KL. 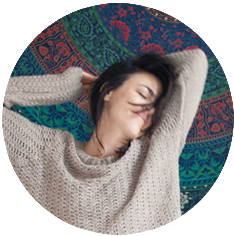 Thanks for this – hadn’t heard of the Simple Life before though everything sounds amazing. What I would give for some mixed fruit tea and seaweed rolls right now!! KL is on our list for next year so I’ve made a note because we really are trying to make more of an effort to eat well on our trips nowadays. This sounds perfect! Excellent! 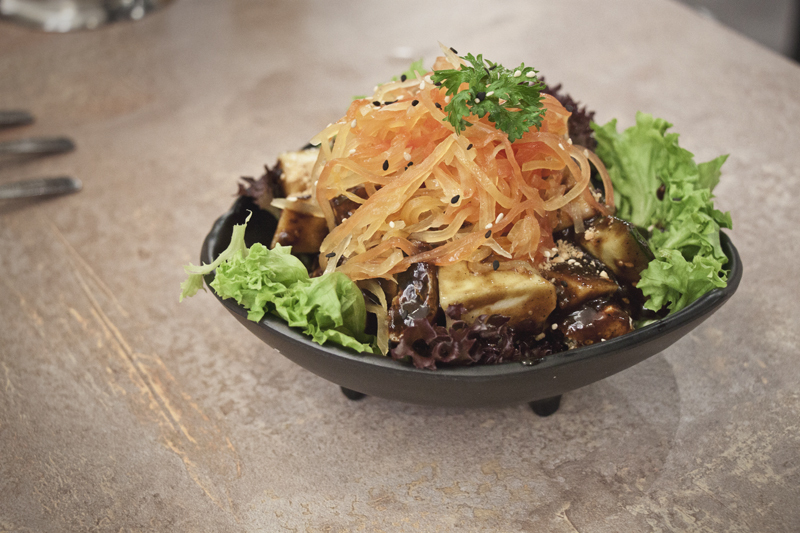 There are so many great places for healthy and delicious meals in KL! This is awesome! Thanks for introducing us into clean eating with Simple Life. Will definitely add it to my list of places to check there! I went to the one in Lot 10 when I arrived on Saturday. I’m going again today – food was amazing!!! I’m drooling over the menu but going to get the tofu (pic looks amazing!) fruit tea and another dish which I’m not sure of yet ? I would love to try the raw food place but would really have to study the map to get there and not mad on there being meat there so will stick to what I know so i won’t be disappointed! Forgot to say that I had the organic bean curd hotpot which was amazing and one of the little dishes it came with was crispy cubed tempeh! Mel, that’s awesome! I’m so glad you are enjoying the food in KL! Let me know if you discover anything exciting I didn’t cover in my guide!